That’s the subject line I just used to send a notice to our Geeks on Tour newsletter list. I’m promoting our Techno-Geek Learning Rally at the end of April. I decided it was also a good title for a blog post, since it’s been a week since I’ve written in here. It’s been a pretty typical week of being parked in Fort Lauderdale. Last weekend, I kept my nose to the grindstone to update our Geeks on Tour ‘Show Me How’ DVD. In essence, it is our entire website on a DVD – about 220 video lessons on all the topics we offer. The updated version now includes the latest videos on Blogger, Picasa 3.9, and Smartphones. It also includes our two books – PIcasa 3.9 and Windows 7 Boot Camp. See the opening screen of the DVD below, and you can click to enlarge. That DVD is the main thing we sell at Rallies and Events. We had two events scheduled on Monday for computer clubs … or at least we thought we had two. Turns out there was a miscommunication and we only had one. And, nobody bought a DVD. Oh well, I got it done anyway. I’m still working on the website presence for my Women’s Executive Club and I got to introduce the new design to the club luncheon on Tuesday. If you do any websites using Wordpress, you should look into Woothemes.com I bought their most recent theme for the WEC website and I am very happy with it – particularly because of it’s automatic way of displaying on a smartphone or iPad. I know there is a lot of ‘under-the-hood’ programming that needs to be in place for a website to work well on a smartphone and I wasn’t willing to do that much work. The fact that it’s all done for me automatically by using that particular theme is just so exciting! It makes me look good. Yes, I really am a Geek! Our friend, Jimmy Lyon came over for dinner one night and I had Jim snap a photo of our dining room / entertainment center which doubles as my office. Computers with a good Internet connection these days are just the best – who needs a TV? Here we are watching a TED talk on the Sunfish, aka Mola Mola, a wonderful lesson on our oceans for those of us who are very interested in these things. Jim worked in the office for his three days at the RV Park. I took Mom to the Doctor one day, Jim took his Dad another. When I picked mom up she asked “So where are we going?” I told her, “To the memory Doctor.” “Oh, I’d forgotten,“ she laughed! It’s good to hear her laugh. Now Jim is off to do some maintenance work for his Dad’s house (with Jimmy’s help) which is up for sale. I, as usual, am sitting at my computer, but I have to admit to a guilty pleasure. It’s not all work at the computer! When Jim left he said, check with Netflix website and see if we have another movie ordered, because I’m returning the one we watched last night (Annie Hall, because I just read the book about Diane Keaton and her mother.) So, as I was browsing Netflix.com I noticed a TV show called Commander in Chief which looked familiar, so I clicked on it just to see if it was indeed the TV show about a woman president. Lo and behold, that single click actually started playing it. I was hooked and spent the next 40 minutes watching the pilot of that TV show … ooohh it was good, too bad it got cancelled. And it’s probably too bad that I’ve discovered it on Netflix. And I wonder where the time goes!?! So that was this week in geek. All in all not bad – but I prefer being on the road. I guess it’s just a fancy word for lucky – but I like that word, Serendipity, and I feel it describes my life. It describes big things like the serendipity of Jim being the person who was assigned to support the computers I bought for my computer training company back in 1993. That was really good luck! More often I notice the little serendipities in my everyday life. Today I got a notice that the forum plugin software I use for my Wordpress-based websites was officially updating to the latest version – 5.0. I doubt that it sounds very exciting to anyone reading this, but I think it’s way cool! We’ve been using Simple-Press Forum 4.x to run the forum on our business website for nearly two years. It’s great software and I always believe in working with the latest versions – so when I decided to use Simple-Press on another website I manage (for Women’s Executive Club) I took a leap of faith and installed the Beta version of 5.0 (Beta means it’s still in the testing stage.) I’ve been working with it for a month or so, getting it ready for the club to use. I promised to present it at the Club’s luncheon meeting this Tuesday, but I was a little nervous rolling out a website feature to the group when it wasn’t yet out of testing. Serendipity! Version 5.0 will be official on Monday – my Presentation is on Tuesday. The word serendipity is a little more specialized than just ‘lucky’ – it means an unexpected pleasant surprise. Wikipedia notes that the classic serendipity is looking for a needle in the haystack and coming away with the farmer’s daughter! It was not unexpected that the software would become official – but I do consider it serendipity that the announcement comes the day before my presentation! When I notice a lot of serendipities in my life I feel charmed. How about you? What serendipitous (? is that a word) events have happened in your life? It was a perfectly gorgeous day for a ride on the water, sunny and warm, but not too hot. 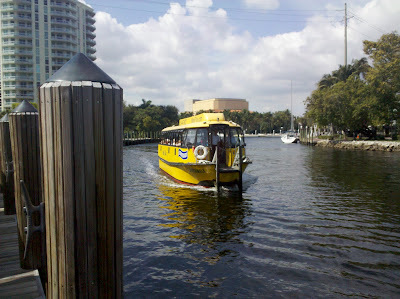 The houses and boats along Fort Lauderdale’s waterways are quite a sight. 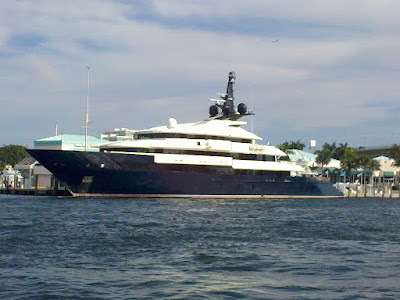 This little boat was pointed out to us as belonging to Steven Spielberg – they say he paid $200 million to build it. I’ll bet it has a great movie theatre inside – whaddaya think? When the water taxi made a stop near the beach at Bahia Mar, we got off and took a little walk on the sand. 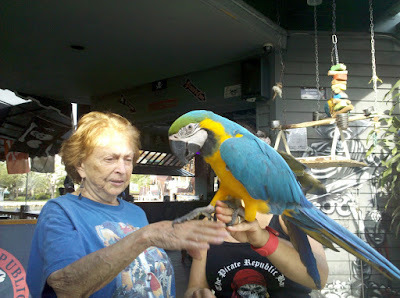 Ahh – winter in Fort Lauderdale! Then we got back in the water taxi and headed back up New River to the Pirate’s Republic where our car was. 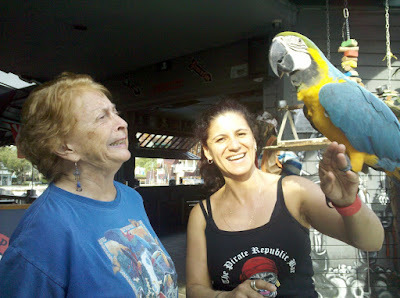 One of the waitress ‘wenches’ offered for Mom to hold the Macaw … she wasn’t so sure! Ever notice how it takes someone coming from out of town to get you to do those special things? It's usually us that are the out-of-towners as we travel around, but this time we're the homebodies and our friend, Jimmy Lyon, from Long Beach Island, NJ is visiting for a couple weeks and he made Jim go out diving! It has either been too rainy/cold or windy ... mostly windy, to go Kayak diving - so neither Jim or I have gone out since we've been here back in October! But, Jimmy hits town and Jim goes with him on a boat dive - no questions asked! The water is a little chilly for me now - 73 degrees - I belong to the 80degree club of scuba diving! But I'll happily eat the lobster Jim caught! Here's Jim and Jimmy taking a picture of the catch before dinner! Tonight we're off to the Boca Raton Computer User Group to present our seminar called "Outsmarting your Smartphone." If you're in the area - this meeting is open to the public. Both Jim and I really, really love what we do. We love teaching about computers to travelers. 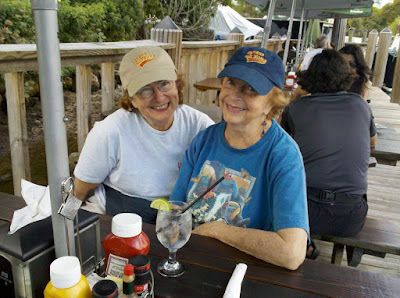 We haven’t been doing too much of it while in Fort Lauderdale this winter, but we’re starting up again. The cruise/conference was great. And then we gave a Facebook seminar to a Computer User Group in Port St. Lucie. Now we’re scheduled at several more computer user groups for February and March. If you’re near the Boca Raton area, please join us tomorrow night for the Boca Raton Computer Society meeting. We’ll be presenting our ‘Outsmarting your Smartphone’ seminar. We keep making it simpler and simpler. I think it looks really good on the tshirts and hats etc. At least I never have to worry about what to wear! In April, we’ll be having our very own Rally! The Techno-Geek Learning Rally in Bushnell, FL on April 22-28. This is going to be just so much fun because we’ll be joined by our friends Phil, Tracey, Ally, and Josh from Techno-RV. They are fulltime RVers and Geeks also. And, they’re British – so they’ve promised us a High Tea as part of the rally, and Phil says he’ll start us off every morning with Tai Chi. We’ll be doing all our Geeks on Tour seminars, but it won’t stop there. We’ll have plenty of time for small group hands-on work as well as free-for-all Q&A sessions. Even with 6 full days, we’re having a hard time scheduling everything. You can take a look at our schedule-in-process. If it looks like something you’d be interested in and you can be in Florida the end of April. Register for the Techno-Geek Learning Rally now. For many of our readers, Nick Russell needs no introduction. He is a writer and a fulltime RVer. He writes a daily blog and it pisses me off! Literally thousands of people read his blog every day (I know – I have access to his website Stats.) And many more thousands have now bought his novel Big Lake and its sequel Big Lake Lynching. I only wrote in this blog twice in the entire month of January, Jim finally had to step in and write one post so we had something to show for our time on the planet last month! I like to write about our travel adventures - and we’ve been parked in one place all winter. I like to write about happy stuff - and I’ve been sad a lot this winter as I watch my Mom decline into Alzheimer’s. Having nothing to say never stops Nick! I read Nick’s blog and he can spend several paragraphs writing about not washing his RV, and he has me laughing all the way. How does he do that?! His novels are real page-turners. It’s been suggested that I might write a book about me and Mom – but I ‘m afraid it would just make people sad and I don’t want to do that. Or worse yet, it would just be boring due to lack of writing skills. It’s been suggested that writers write – and that’s what blogs are for – an easy way to write all the time. So I should write often, even if I don’t have anything I want to share. If Nick had been in my shoes this month, he would have written every day and had the readers laughing, crying, and pondering life’s mysteries with each and every post. I could blame my lack of blog posts on being busy. I’ve written posts on our Business Blog, and our Picasa Blog, and our Facebook page, I wrote our monthly newsletter, responded to customers’ questions in our forum, I’m writing an article for Highways magazine and I’m constantly updating our website and several customers’ websites. Hey – everybody’s busy … you and I both know that the reason I haven’t written is because I can’t write like Nick Russell.